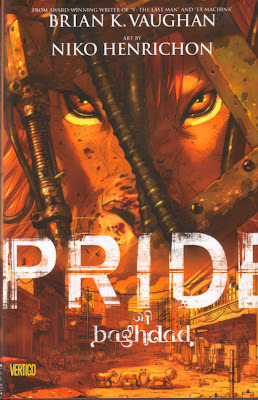 We take a little break from superheroics this month, as the HDCC turns its eyes, not only toward the anthropomorphic, but also the international as we discuss PRIDE OF BAGHDAD by Brian K. Vaughan and Niko Henrichon, published by Vertigo/DC comics. Baghdad first came out as an original hardcover a little over a year ago, and I dodged it on the shelves then, opting to wait for the softcover. Needless to say, I'm pretty excited about reading this one since it'll be the first time for me -- something that I don't get outta comic club very often. We'll be meeting at the Villa at 7:30PM on February 7th to rap about the cats. If you've got questions or need directions, call (803)731-4376 or (803)731-9049 and we'll get you taken care of. i saw this. this was awesome.